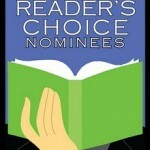 I got a lovely email today, letting me know that Shades of Milk and Honey is a SLC Reader’s Choice nominee. You all know how much I adore libraries, so to be on this list is a real honor. The Salt Lake County Library System is the largest in Utah, serving over 650,000 residents, through 18 libraries. Twice a year, the Reader’s Choice Committee selects twenty or more recently published books that have been recommended by other staff or customers. We want to include those titles that are not a “best-sellers” but are so good you just can’t put them down — and when you do finish, you have to tell all your friends! These books are purchased in multiples and placed on display at each Salt Lake County Library for a four-month period. After reading any of the books on our Reader’s Choice list, customers may rate the books using one of our ballot forms. Twenty-nine titles have been chosen for the voting period. The title receiving the most #1 votes from our customers by November 1, 2011 will be declared the winner. You can see the full list at http://www.slcreaderschoice.blogspot.com/ or jump straight to Shades of Milk and Honey.